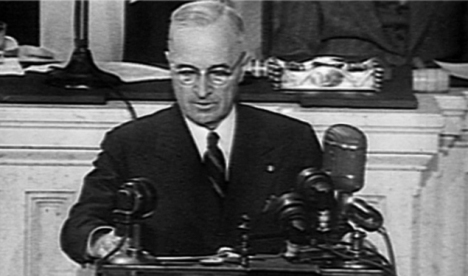 JFK was in a back row seat for President Harry Truman’s address at 1 PM to a joint session of Congress arguing for an aid package to Greece and Turkey of $400 to prop up the national governments in their fight against a growing threat of Soviet takeover. Jack supported what was to become known as the Truman Doctrine and the outright grants of foreign aid to countries where the United States had strategic interests. Only twice did applause break out and then it rippled fitfully across the crowded Hall of Congress and died. Reporters noted that never in recent history had a Presidential message been received with such a deep sense of awareness of what that message might mean to the security of this country and to the peace of the world.